A few weeks ago, I joined some local collector friends for what we called the "midwest roundup". We went to 2 private gamerooms and finished the day at the "Vintage Vault" (The Basement Arcade). Jeremy had a dead Zaxxon that he found for a good price awhile back. He was nice enough to pass this project on, and I graciously accepted and drove it home that night. Thanks Jeremy. Oh, and did I mention this was during a snow storm? 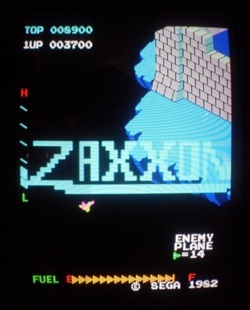 Now I'm not much for Zaxxon, but it is a classic and I welcome the opportunity to save a game every now and then. The PCB would either show garbage or an upside down hi-score screen, but nothing more. I found a couple of chips with very dirty legs, pretty much black. After a good cleaning, no difference. I then picked up an extra "untested" Zaxxon boardset in a bulk deal, along with a new joystick that the game also needed. Even if this other PCB wasn't working, I might be able to make a good boardset out of the pair, who knows? Keeping my fingers crossed, I plugged it in, turned the game on and was greeted to the picture you see here. Nice. What's even better? Now, out of the blue, the original boardset decided to start behaving. So now I have 2 working boardsets. They both have a small sound issue that Zaxxon's are notorious for. It's a quick, easy & cheap fix thats next on the list. I also have plans to give the cabinet a nice paint job if it's still around in the near future. In the meantime, I'll enjoy a few rounds. 11/7 - MK traded for Donkey Kong Jr.
Click image to go to DK Jr. page. Yes, Mortal Kombat has left the cave. As big of an icon as MK is, it just wasnt getting any love in the basement. I was the only one playing it, and even I was only playing it every once in awhile and usually for a brief amount of time. Were just "old school" around here, and apparently so are the kids. Ever since Donkey Kong and Mario Bros. joined the lineup, I always had it in the back of my mind that there was a missing piece to the Nintendo puzzle. That piece was Donkey Kong Junior. It was one of the first games I remember playing on the Atari 2600, and I enjoyed it even more when it came to the NES. Now fast forward to the present time. All these games have flooded my basement, and Donkey Kong could use a Junior beside him to keep him company. But theres a dilemma. I'm out of space and out of cash. Also, for whatever reason, although DK Jr. is a fairly common game, I havent found one anywhere nearby within my reach for quite some time. 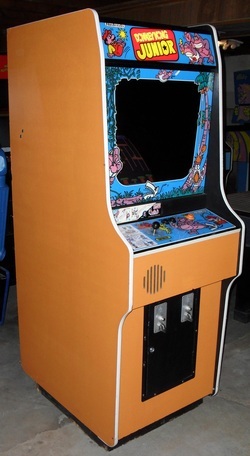 Even the auctions have lacked, not one single Nintendo cabinet. What to do? I worked out a trade deal with Slackers. They are a chain of video game stores (they also buy, sell & trade CD's & movies) here in Missouri. They also put arcade games in their stores, and I have sold them quite a few in recent months, 4 of them at the Jefferson City location alone. Anyway, their Columbia store had a Donkey Kong Jr. game in decent shape. Only flaw worth mentioning was the ripped up side art, but for this particular game, its a cheap and easy replacement. It sat there munching on quarters for quite awhile, just teasing me. I think this game was begging to be in my basement. As soon as I noticed a price drop, I put MK on the table and they agreed to a trade. So MK, you will be missed, but welcome home Junior. Click on image to go to Space Zap page. Awhile back, I bought a blacklight for my Tron to illuminate the new topper I bought from gamestencils.com. It just so happens that my Space Zap was nearby while testing it, and I quickly noticed that the bezel was glowing. I discovered that moving the blacklight closer really made the bezel come to life, and since the game has a mirror on top, it also enhanced the glow. I immediately began thinking that this game was absolutely naked without blacklights somehow attached, but I didnt want to add another fixture to the game. Funny how Midway never noticed this and never added blacklights to the game. I searched on eBay and found these 10" LED blacklight strips. They are normally used in automotive applications and hardwired to any DC power source up to 12v. Mounting them to each side was pretty simple using the proper size wire loop hangers, I happen to have a handful of them in black. Wiring was as simple as one going to ground and the other to a 6v source inside the cab which is also used by the marquee lamps. I also added a button to the coin door to add credits. This game has one of those early runs of Midway coin doors which include a round plug between the coin inserts. Apparently they offered an option to have a button in it's place for this very purpose. While mine is not the original "factory" button, it fits the hole perfectly, and it even lights up. Nice. Click on image to go to Gorf page. My Midway lineup started with the unplanned purchase of a Satans Hollow game. Then about a year later, I picked up a Tron and, more recently, Space Zap. I never thought I'd be building towards a Midway "row", and there was just one more game needed to complete the puzzle. That game is GORF. An acronym for "Galactic Orbiting Robot Force", its a fun space shooting game which consists of 5 mini-games, including variations of Space Invaders and Galaxians. It also happens to be in a cabinet similarly shaped like Tron with some cool lighting effects. As soon as I brought Tron home, I immediately wanted a Gorf to put next to it. It wasnt long before I found this one lurking on Craigslist. It wasn't working, but was complete with the exception of a trim piece, and was priced accordingly. I couldnt pass it up. Whats better, I just picked up a working Space Zap which uses the same hardware as Gorf, so diagnosing this game should be fairly simple. This game was in Saint Louis, and a good friend of mine, who's office is only a few blocks away from the seller, agreed to pick up the game and hold it for me until I could make the trip. Now it's time to get to work on this game and add it to the lineup.